I am excited! My work is on the cover of Be Creative with Workbox, Issue 155 ( May/June),it is out on April 8th. 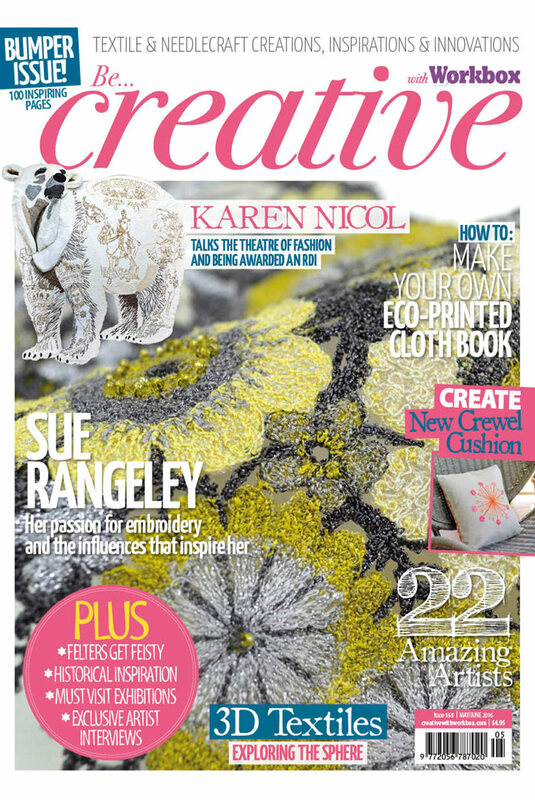 Inside the magazine is a seven page feature exploring my creative world and some of my favourite embroidery techniques. The article is beautifully illustrated with images by Michael Wicks; many of you have enjoyed seeing Michael’s photographs in ‘Embroidered Originals’ and we are working together again on my next book. I have also included a few photos in the article by Emily Gale (work placement student from R.S.N. in 2013); Emily revealed a double talent during her time in my studio, a skilful embroiderer and creative with the camera lens too. Excuse me for being a show-off by giving a triple promo for this magazine appearance, first in the Spring Newsletter, then flagged up on my website and now I am writing about it on my blog!! To purchase the magazine go to the link on the Home Page of my website. I am also thrilled to be in the same issue as the amazing embroidery artist, Karen Nichol; her inventive creations and wildlife textiles always bring a smile and a gasp of admiration. The last time we shared the pages of a publication was in Diana Springall’s 2005 book: ‘Inspired to Stitch – 21 Textile Artists’ (A&C Black); Diana’s curated exhibition at The Knitting and Stitching Show to launch the book, also featured our embroideries. Back in the studio, I am preparing to work on new samples and the mood boards are demanding my attention, inspiring design ideas for stitch. Outside the garden vista is springing to life in the April sunshine, always an inspiration to get stitching; last year’s pansy portraits are giving me a few clues of where to begin this month’s stitch story…………………. © 2010-2019 Sue Rangeley - All images on this Web Site are the copyright of the Artist and, where applicable, the photographer.